Sweep a clean path easily and efficiently with the Power-Take-Off-driven angle broom attachment. Quick removal jobs can be completed without damaging pavement surfaces year-round. In the winter, it will clear light snowfalls. During the spring and summer, it will dethatch lawns and clean off sidewalks and ball courts. In the fall, use it to sweep leaves and other debris. The worm-gearbox eliminates maintenance like greasing the chain or making tension adjustments. This also makes it easier to replace the bristles by removing only four bolts. The broom bristles have a waved design, delivering more surface-clearing ability. 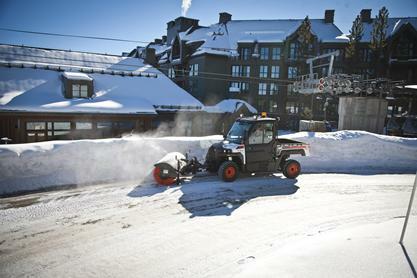 This clears a cleaner path and can sweep more snow or debris in one pass. The angle broom attachment is compact, maneuverable and easy to operate, replacing manual labor. Sweep flush against walls, fences, curbs or other obstructions without drive motor obstructions on the sides of the sweeper. With oscillation and float, you can transition between sidewalks, streets and other surfaces without leaving any snow or debris behind. Clean small and large areas with less effort and in less time. The angle broom is designed with the Multi-Attachment X-Change™ (M.A.X.) System system which allows attachments to be changed trouble-free and without tools so you can attach or remove equipment quickly. The angle broom attachment uses a PTO-driven, rotating broom that sweeps dirt, snow and other debris away from the machine. The angle broom will continuously sweep debris ahead of the UTV or angle the broom to windrow material to the side. Floating Broom Head: Broom head follows surface terrain to ensure the bristles sweep away debris even on sloping pavement such as curbs. Centering Linkage System: Allows the operator to sweep debris away from buildings without increasing the gap between the head and the building while angling. Chainless drive: Eliminate maintenance like greasing the chain or making tension adjustments. Crank Stand Adjustable Wheels: Eliminates bristle distortion during storage. Easily set and maintain the sweep height to reduce excessive bristle down pressure. Lower wheels to dethatch lawns. Easy Maintenance: Quickly and easily replace bristles without removing chains, sprockets or the broom core. Removable end plates provide quick access to change the bristles. Hydraulic 25 Degree Angle: Move debris exactly where you want it using the joystick on your UTV. Finish the job quickly and efficiently without having to leave the comfort of your seat. Multi-Attachment X-Change (M.A.X.) System: Makes easy work of attaching and detaching the angle broom from the utility vehicle. Fast and easy mounting means spending less time on attachment changes and more time on the job. Replaceable Bristles: Convoluted polypropylene 24 in. bristles provide excellent life and cleaning ability. Bristles have excellent durability and the spacer-free design provides fast flick action for superior cleaning.